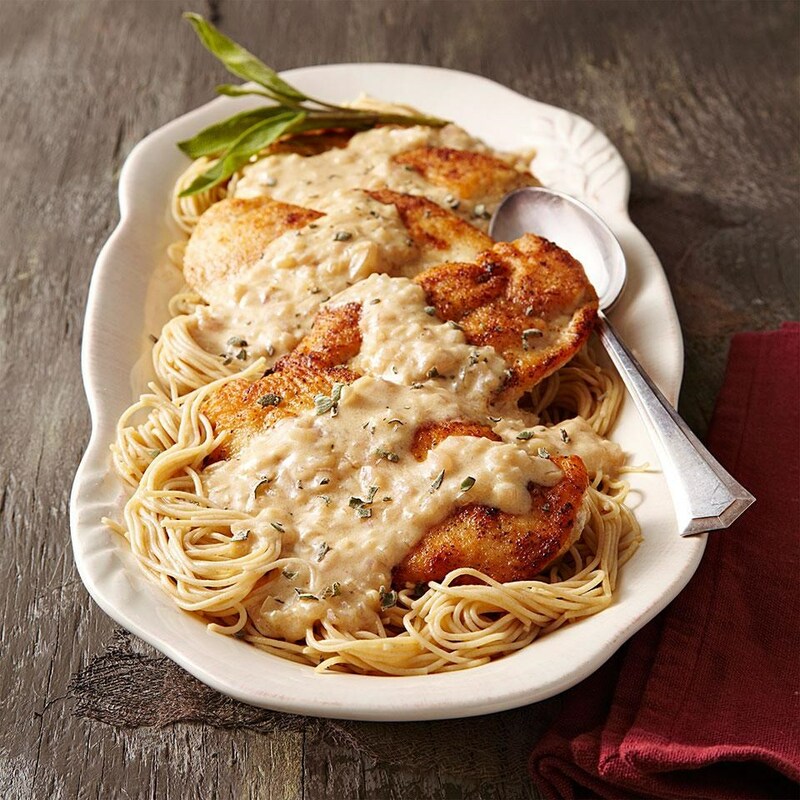 In this healthy, creamy mustard chicken recipe, thin-sliced chicken breasts (sometimes labeled chicken cutlets) cook quickly and are delicious smothered in a velvety, light mustard sauce and garnished with fresh chopped sage. If you can’t find chicken cutlets, cut boneless, skinless chicken breast into 4-ounce pieces and place between pieces of plastic wrap. Pound with a meat mallet, rolling pin or heavy skillet until flattened to about ½ inch thick. Meanwhile, sprinkle chicken with garlic powder and ¼ teaspoon each salt and pepper. Place flour in a shallow bowl and coat both sides of the chicken, shaking off any excess. Reserve 2 teaspoons flour; discard the rest. Reduce heat to medium and add the remaining 1 tablespoon oil to the pan. Add shallot and cook, stirring, until beginning to brown, 30 seconds to 1 minute. Add wine and cook, stirring occasionally, for 1 minute. Combine water with the reserved 2 teaspoons flour. Add to the pan and cook, stirring, until thickened, about 1 minute. Remove from the heat; stir in sour cream, mustard, 2 tablespoons sage and the remaining ¼ teaspoon each salt and pepper. Return the chicken to the pan and turn to coat with the sauce.